__From the archives. This is terrific freshy made and hot, but is even better cold, so it's great for bentos. Originally published in November 2007.__ Over the past couple of years as I've pursued largely vegetarian eating, I've gradually accumulated a small arsenal of small, round bean patties or balls, which are great as snacks, for bento boxes, and just for dinner, in my regular rotation. This one was inspired by one of the first beany-round thing I made, the samosa-like lentil snacks from The Hungry Tiger, and a Japanese vegan cooking book called _Saisai Gohan_ (Vegetable Meals) by Yumiko Kano. (Yumiko Kano is currently my favorite cookbook author in any language, and I'll talk more about her down the line.) I've adjusted a few things to make them gluten-free. These have the earthy, deep flavor of the black beans that is enhanced by the spices and the sauce, and they are delicious hot or at room temperature. Even diehard carnivores like them. 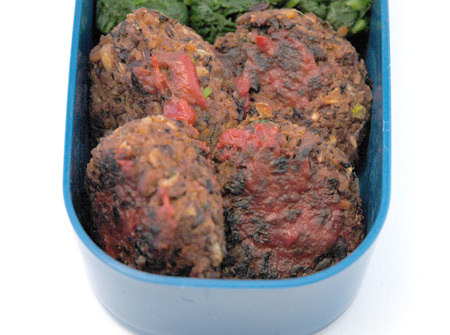 They're really perfect for bento lunches, and I've used it in the all-vegan Bento no. 5 on Just Bento. I also used them as a pita-sandwich filling in Bento no. 6. I have described two methods of cooking these: in the oven, which is good for making them in quantity, and in a frying pan, which is perfect for making a few at a time. ###Black bean vegan mini burgers This amount makes about 12 tiny or 8 small burgers; multiply to suit your needs proportionately. It keeps pretty well in the refrigerator for a few days, and freezes well too, so it makes sense to make in some quantity. 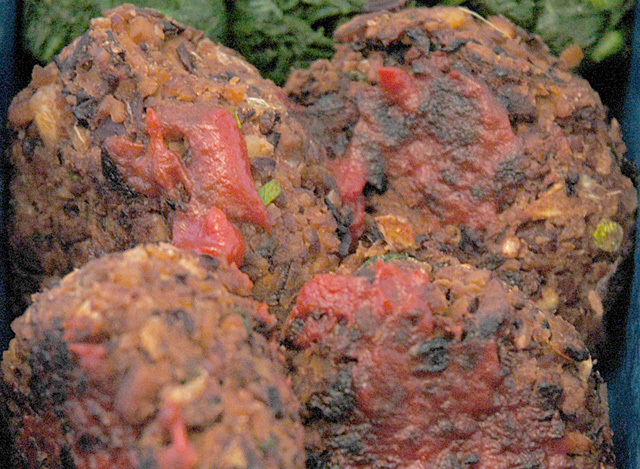 For the burgers: * 2 cups (500ml) of cooked or canned black beans, drained * 3 tsp. fermented black beans, or 2 tsp. miso * 1 small piece ginger, finely chopped to produce about 2 tsp. chopped ginger * Green onions, to produce about 3 Tbs. chopped * 1/2 cup chopped fresh mushrooms * 2 Tbs. chopped walnuts * 1/2 cup rice flour * 1 tsp falafel spice mix, or cumin powder * 2 Tbs. or so of olive oil For the sauce: * 4 Tbs. tomato paste * a few drops of Tabasco * 1 Tbs. maple syrup * A little hot water to thin out the sauce, if needed Suggested equipment: a food processor If you're going to be baking them, preheat the oven to 200°C / 400°F. Chop up the ginger, green onions and mushrooms finely, and sauté in about half of the olive oil until the mushrooms are wilted and brownish. In the meantime, chop up the nuts. Add to the sauté pan to toast a bit. If using the fermented black beans, chop finely until they're almost a paste. Reserve a couple of spoonfuls of the beans. Mash up the rest of the beans with a masher or in the food processor. Put the fermented black beans in and process until it's fairly smooth. Add the spice and rice flour and process again. Add the sautéed vegetables, the reserved beans and the nuts, and pulse-process until mixed (you want some of the texture to remain). Divide the mixture into 8 to 12 portions. With moistened hands, make into flat little patties. If baking in the oven, oil a baking sheet and then brush the tops with a bit more oil. Bake for about 10 minutes, flip then bake 5 minutes more. If cooking in a frying pan, heat up the pan with the rest of the oil. Fry the burgers until crispy, carefully flip over and fry the other side. In the meantime, mix the sauce. Brush the sauce onto the hot burgers, or serve separately for dipping. Good hot or at room temperature. ###Notes Fermented black beans (_dul see_) are actually black soy beans. You can get them at any general Asian or Chinese grocery store. You can use miso instead if you have that on hand, though it will be a bit less salty and well, different. Black bean sauce can be used also, but be aware that that has some wheat flour in it if you're gluten-conscious. If you don't want to bother with making the sauce, use your favorite ketchup with a few drops of Tabasco added. These keep well for a few days in the fridge, though they are better if you re-heat them to take the chill off before eating. They also freeze well. Rice flour is available at Indian grocery stores (red rice flour is a bit different and interesting to use here), or in Japanese grocery stores where it's known as _joushinko_. It's mainly used here as a binder, so you can use regular wheat flour instead if gluten-sensitivity is not an issue. Variation: Add fresh chopped coriander. Submitted by maki on 2009-09-21 09:23.
sounds yummy. i am going to give it a try. thanks for adding a vegan-veggi. option. Just thought I would help out - I know it must just be an oversight. The above recipe is missing 2lbs ground Kobe beef. AND I am so making these too. These look great! I can't wait to try them. Just one small question...if you don't like mushrooms, what would you suggest using in their place? Mine would come in the lettuce wrapped variety as I am gluten-free... and is the maple flavor strong? They look really, really good. They look wonderful. I'll use chickpea flour, I think. Perfect for a bento. I made these tonight, and they were wonderful. I forgot to get a few of the ingredients for the sauce though, but they were great just with plain ketchup. I will definitely be making these again, and am looking forward to having them for lunch tomorrow! I am a vegan and i would love to try this recipe!please post more vegan meals if possible! Oh no - I have everything but walnuts on hand. Do you think this could be done without them without sacrificing too much flavor/texture? I made these last night, leaving out the miso paste and the walnuts. Instead I added some carrots and green peppers. 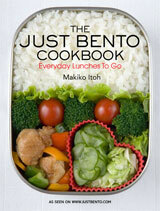 Very tasty and yummy, a must for my bentos! Thanks Maki. I'm glad you've brought this back from the archives; for some reason I've never tried them but am really tempted to. Would hatcho miso be suitable, considering the dark colour and strong flavours, or would that be too much? Try using 1 tsp. of hatcho miso, tasting the mixture and adding more if needed. Hi, this recipe looks great especially for taking to school with me, but when using black bean sauce instead of the fermented black beans do I still use 3 tsp? You will have to experiment a bit. Try adding 1 tsp, taste and add more if needed. I have some fermented black beans and I am always looking for other recipes to use them in. These look great! I just made these, but with a few modifications. I used whole wheat flour because I didn't have rice flour. I used a teaspoon of hoisin sauce and a teaspoon of nutritional yeast with a little water, because I didn't have fermented black beans or miso. I used adobo spice mix because I didn't have falafel spice mix. I used pecans because I didn't have walnuts. Now, those modifications were born of necessity, but because of the southwestern turn they seemed to be taking with the adobo, I decided to glaze them with a chili powder-spiked ketchup instead of the glaze from the recipe. They were delicious! I made this while forgetting to reserve the whole beans, and thought it came out quite well - perhaps enough to convert some meat-eaters. Added some soy sauce to adjust the saltiness and got comments of "looks like a burger" from bystanders. I have beans soaking for tomorrow - thanks for the recipe! I bet my magic bullet would just eat this up =) I'm always looking for more quick recipes that I can use with the magic bullet; the little booklet that comes with it is kinda bland lol. Thanks for the great recipe, can't wait to try it. I did it! I made a batch and they're yummy! They turned out a little bit dry, so maybe I'll add some olive oil to the 'batter' next time. And after I added the flour and veggies, my poor blender/food processor couldn't handle the mixing! So I just used a spoon. My roommate is allergic to walnuts, so I used raw unsalted cashews. Worked out fine. Would other types of beans work as well? I found lots of canned beans while cleaning out my pantry and need ways to use them up. I know I have pinto beans and kidney beans. Megan- I don't see why not, I would just double check the amounts by figuring out the ounces of the measurements of different bean types, although it would probably be similar enough to just do the same amounts. I have a question too, maki, would it be okay to use spelt flour instead of rice flour?? I made these a couple weeks ago and they were great. When I started to mix in the flour with the rest of the ingredients they seemed dry so I added some of the liquid from the canned black beans. That seemed to help keep them moist. Overall, I really enjoyed these and plan on making a double or even triple batch next time so I can freeze some. Just made these today- delish! I made a couple alterations that worked out well. I halved the amount of flour. I don't know why there was so much to begin with, it worked good with less. I happened to have some finely chopped pistachios on hand so I added those in as well as the walnuts! Yummy! I didn't have falafel spice but wanted to add more than cumin so I used a combo of cumin, dried coriander, and cardamom. I forgot to thaw my tomato paste to make the sauce, so I just used some BBQ sauce I had on hand- it was great! I just made a bean patty inspired by this with dried (green) soy beans as the bean that I cooked up to medium firm (approx. 30 or 40 min). I mixed them with miso, flour, ginger, onion, roasted garlic and grated carrot. Pan fried with a little sriracha mayo they are delicious! I forgot the nuts, but I had intended to put some cashews in. The soy beans are new to me as a dry bean, so I wasn't sure what they would taste like. They are lighter and more vegetal than black beans, certainly, and the overall effect is kind of like potato pancake or croquetas. I'm going to serve the patties as 'burgers' on steamed bun bread (another recipe of Maki's that turned out awesome) with sriracha mayo and tomato chutney. Thank you for being a continuing inspiration, I have so much fun playing with your ideas and recipes.